Analysis shows hundreds of misconduct findings overturned. Discipline for making racially insensitive comments during a traffic stop? Tossed out and expunged from the record. Punishments for making false statements, an offense for which the department says it has zero tolerance? Those, too, were wiped away as if they never happened. The result: the weakening of a police accountability system that rarely finds fault with officers’ actions in the first place. By the time an officer’s misconduct appeal reaches the Police Department’s Management and Labor Affairs Section, where grievances are handled, the officer has already been found at fault in an internal affairs investigation or after an inquiry by the city’s police watchdog agency, whose findings are public. In some cases, the discipline already has been upheld by the Chicago Police Board, whose decisions also are public. But the department’s labor office operates behind closed doors and according to requirements contained in the police union contract. Victims and complainants were not told when an officer filed a grievance nor were they notified of its outcome. The decisions that overturn discipline can have little to do with the facts behind the actual misconduct. The system’s notorious inefficiencies end up working in an officer’s favor, with punishments being dismissed because investigations took too long, the Tribune-ProPublica Illinois investigation found. The Police Department has no system to track cases, so reporters used data and records from the department and its oversight agency to follow more than 300 disciplinary cases, analyzing changes between the original discipline orders and the actual outcomes. A Chicago Tribune-ProPublica Illinois investigation tracked more than 300 police disciplinary cases appealed through the department’s labor office, the Management and Labor Affairs Section. 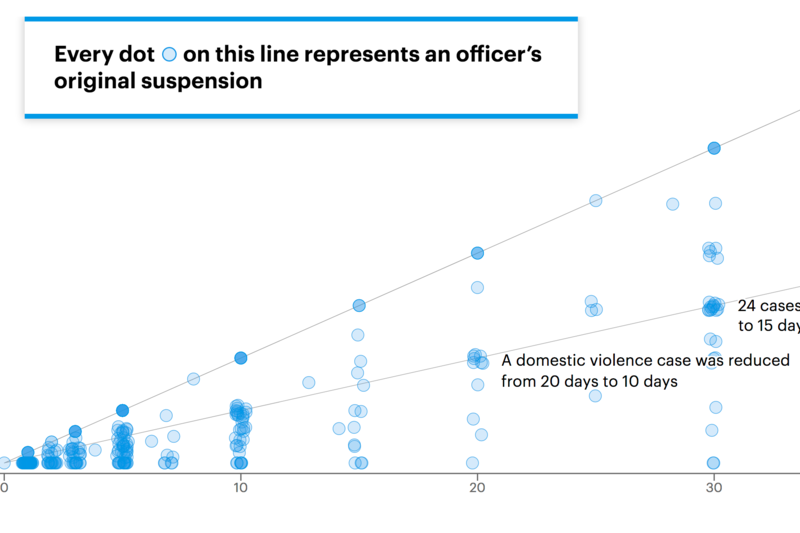 We analyzed changes between original discipline orders and what officers actually served. In 85 percent of cases, appeals led to officers receiving reduced punishment or seeing their punishment overturned. The department provided a data set of grievances in response to open records requests, including information that showed which cases were expunged. Reporters then used investigative reports, arbitrator opinions, settlement agreements and other records to examine the cases. Some of the documents were provided after the Tribune filed a lawsuit a year ago against the Police Department. The investigation found that, of 314 disciplinary appeals the police union pursued on behalf of officers between February 2010 and February 2017, 266 led to favorable outcomes for officers. Police had their punishments reduced or — in 58 of those cases — had them overturned entirely. About half of the 314 total grievances were decided by an independent arbitrator selected by the union and the city. In the others, union officials and city lawyers negotiated settlement agreements before arbitration began, typically for officers to receive a reduced punishment in exchange for withdrawing their grievances. Sharon Fairley, the former chief administrator of the Civilian Office of Police Accountability (COPA), which investigates officer misconduct, said the frequency with which officers win grievances raises questions about the disciplinary system. “We should understand why this is happening and try to make sure that the process as it works has some integrity,” she said. Nearly all the grievances involved suspensions, and the total number of days officers were suspended was collectively cut by half. Officers can appeal punishments up to a yearlong suspension, but appeals of firings are decided by the police board, not through the grievance system. The department suspends an average of 192 officers a year, from a police force of 12,000 sworn officers. Depending on the year, between 13 percent and 47 percent challenged the punishment, the investigation found. Police successfully appealed discipline for all kinds of misconduct: neglect of duty, insubordination, drunken driving, domestic violence and excessive force. 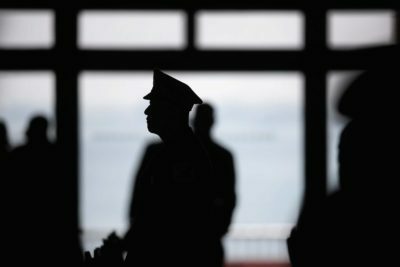 Officers were more likely to get their punishment overturned completely when the case went to an arbitrator, while they were more likely to see a reduction in discipline — or some of the findings tossed out — through a settlement. There is little to risk by seeking the review, and, in fact, 14 officers appealed multiple cases during the period analyzed by reporters. One officer filed four grievances and won three. “It doesn’t hurt to grieve it. Why wouldn’t I?” said Officer Jeffrey Kriv, who records show has successfully challenged at least two suspensions during his 21 years on the force. Kevin Graham, president of the Fraternal Order of Police, the union that represents rank-and-file Chicago officers and that is in negotiations with the city over a new contract, said appeals are necessary because oversight investigators and the department sometimes overreach. Even after reporters identified lost cases, only some officers served suspensions. In a written statement, police spokesman Frank Giancamilli said the initial punishments served on officers are “carefully considered” to reflect the seriousness and nature of a case. They remain the department’s official stance, he said, even if they are later overturned or settled. Bill McCaffrey, a spokesman for the city’s Law Department, said city attorneys weigh each case individually, and that decisions to settle cases before arbitration are driven by the likelihood of winning, more than the nature of the misconduct. He said the city “is disappointed in any loss in the arbitration process” and sometimes agrees to settle — including in cases where police were found to have given false statements — when a careful analysis suggests the city might lose at arbitration and establish an unwanted precedent. 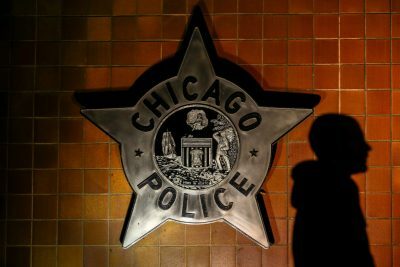 But at a time when the city has promised greater police accountability, its grievance system potentially undermines that, especially since the punishments often have been agreed on by multiple police officials, said Mark Iris, a Northwestern University political science professor and former executive director of the police board. By settling cases, the city avoids the cost of arbitration — and the chance it will lose entirely — and usually ensures the officer receives at least some punishment. During the past seven years, the department has settled 151 cases, the Tribune-ProPublica Illinois analysis shows. More than 75 percent of suspensions from those cases were cut by half or more through negotiations. In addition, some of the settlements include an agreement to drop one of the most serious findings against an officer: a violation of police Rule 14, making a false oral or written statement. Department officials have said they have zero tolerance for officers who aren’t truthful, and that those who violate the rule will be fired. But the Tribune-ProPublica Illinois investigation found that, since 2010, the city has negotiated settlements with at least 19 officers that included expunging from their records findings that they had given false statements during an investigation. About half of the violations were tied to excessive force cases or issues during arrests. The discipline recommendations in these Rule 14 cases were all made prior to the current police administration, and the department said that it now moves to fire officers who violate Rule 14, so they are not able to file a grievance to dispute it. A violation of police Rule 14 is problematic not only for the officer, but also for the department and the city. Lawyers have ammunition to challenge an officer’s credibility in court, and the officer might be viewed as dishonest in other aspects of the job, making it difficult to keep him on the street. When the city settles grievances with officers, including those that result in Rule 14 violations being dropped, the agreements provide no explanation for why a punishment is reduced or a charge eliminated. Fairley, the former COPA chief administrator, said the city and department “have to be careful” when they decide which cases to settle. “Our view is that a Rule 14 should never be settled,” Fairley said in an interview before she left COPA in October to run for Illinois attorney general. The department said it settled Rule 14 cases that it felt might not hold up if taken to arbitration, including because some cases were old or witnesses were no longer available. It said it also tries to gauge its odds of success by looking at whether similar cases were overturned in arbitration. A revamped agency takes a step backward in informing the public. But the settling of 19 cases is even more significant in context; few officers were found to have violated Rule 14 in the first place. “Enforcement in this area is rarely taken seriously and is largely ignored,” a U.S. Department of Justice investigation released early this year found. The Justice Department investigation found 98 Rule 14 violations were sustained during the past five years, and questioned whether the number was low because officers were rarely held accountable for being untruthful. 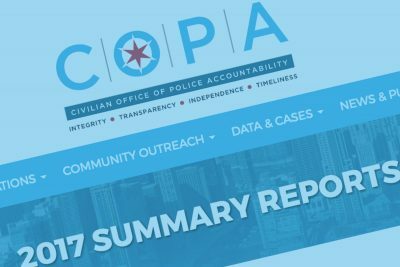 That’s why Officer Vincent Torres’ disciplinary record won’t show that police officials years ago concluded he provided a false statement about his conduct to the Independent Police Review Authority, COPA’s predecessor. Torres and his partner had stopped some teens in 2009 because they suspected the teens had just defaced a garage with graffiti and were driving the wrong way down a one-way street. Witness Ed Zotti said he heard a commotion while working in his Lakeview home and looked out to see Torres kick the teen in the head while he was lying facedown in the street. The kick was so strong, Zotti said, that the teen’s head snapped back. Disturbed by what he saw, Zotti, editor of the Straight Dope column in the Chicago Reader, wrote a letter to then-Superintendent Jody Weis saying, “I hope you will make clear to your officers that this kind of thing will not be tolerated.” He was interviewed by IPRA. The last he heard, several years ago, his complaint had been upheld. It was, not only by IPRA but also on appeal to the police board. IPRA and the police board found Torres violated Rule 14 when he said he hadn’t kicked the teenager because both the teen and Zotti — who never spoke with each other — gave consistent accounts of what happened. Torres was given a 30-day suspension for kicking a handcuffed teenager and denying it to investigators. He filed a grievance in 2014. The case was headed to arbitration earlier this year when the city agreed to cut the suspension in half and drop the Rule 14 violation, and Torres agreed to drop his grievance, according to records from the department and IPRA. Torres could not be reached for comment. Settlements are subject to open records requests but otherwise are not posted or shared with the public. Victims are not informed of the agreements. Zotti, 66, said in a recent interview that he couldn’t understand how the city could drop the Rule 14 charge but uphold the excessive force. Cases that the city and union don’t agree to settle go to an arbitrator, whose decisions are binding and become the final word. Of the 147 suspension cases over the past seven years decided by an arbitrator, officers won 112, or about 76 percent of the time, records show. Officer Matthew O’Brien faced a misconduct investigation after he stopped a car of five young black men, most of them out-of-town college students here for the Taste of Chicago during the July Fourth weekend in 2009. Police wrote tickets for tinted windows and not having a city sticker, then let them go. The men, two of whom had studied criminal justice in college, were so upset about how O’Brien treated them that they immediately lodged a complaint with IPRA and filed a federal civil rights lawsuit, which the city later settled for $9,500. Jontavious Pruitt, who was 26 and from Tallahassee, Fla., remembers feeling humiliated as O’Brien searched the trunk of the car, took bottles of unopened liquor from a bag and smashed them on the ground. “I don’t know if it was for laughs and giggles or jokes. I do know that’s not the way a police officer, someone who is supposed to be protecting us, should treat us,” said Pruitt, an information technology manager for the Atlanta Aviation Department. 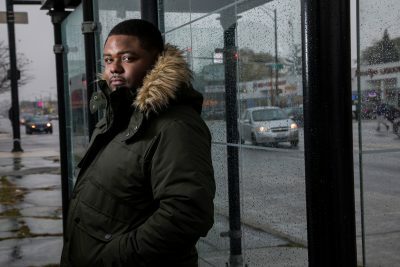 O’Brien, IPRA determined, deserved a 10-day suspension for verbal abuse and a search of the car without justification, though the police superintendent disagreed. O’Brien took the case to the police board. He argued that he was alone in an unsafe neighborhood on the city’s South Side and acted because the car’s windows were tinted. He denied making any racially charged comments. O’Brien filed a grievance that December. The case was heard by George Roumell, who has ruled on more Chicago police grievances than any of the other nine arbitrators who have decided cases since 2010. With those words, the suspension was thrown out. O’Brien was promoted to sergeant this year. Roumell and other arbitrators regularly overturned punishments because of the length of time it took to investigate the misconduct — a persistent problem for the Police Department and the city’s police oversight agencies. The IPRA investigator who examined O’Brien’s case interviewed witnesses and the officer within a year but didn’t issue her report until two years after that, Roumell wrote. He mentioned another case in which he threw out an officer’s 45-day suspension on similar grounds. Another one of the men, Donya Jackson, then 23, said his desire to become a Chicago police officer ended that night. He now lives in Washington, D.C., and works in law enforcement for a federal agency. Roumell, who at 89 has been arbitrating cases for decades, declined to comment. A lawyer in Detroit and a former president of the State Bar of Michigan, he has ruled on at least 75 cases since 2010, siding with the officer 79 percent of the time. In 17 cases, he erased the punishment completely. While the grievance process is opaque, arbitrators’ written rulings offer some insight into the process and show that their rulings often are about more than officers’ conduct. In labor arbitrations, the Police Department and other government employers must prove there was “just cause” to discipline the officer. The department has to show the officer was afforded due process during disciplinary proceedings, that the evidence proved the misconduct and that the punishment was warranted. Arbitrator Daniel Nielsen, who has sided with officers in 22 of 26 cases he has decided since 2010, said officers succeed so often because the union backs only the strongest grievances. And, in fact, the union filed an additional 100 grievances since 2010 only to later withdraw them, the Tribune-ProPublica Illinois analysis found. The losing party pays the arbitrator’s fees. The union, for instance, took the case of an officer suspended five days for a minor paperwork blunder. The officer had written a parking ticket to an off-duty police sergeant but missed an additional paperwork step and the sergeant filed a complaint against him. The union argued that the penalty was “very heavy-handed.” Arbitrator Jacalyn Zimmerman agreed and threw out the suspension. “To discipline this officer in this manner for a technical violation is, quite simply, unconscionable,” Zimmerman wrote in her decision last year. 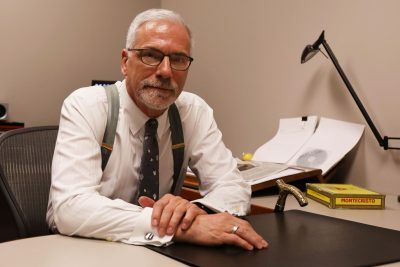 An arbitrator’s decision can be subjective, said Robert Perkovich, a DePaul University business professor who for 20 years has served as an arbitrator in Chicago police cases. He likened a disciplinary case to a “house of cards” that can fall apart anytime depending on the evidence, even when the misconduct is not in dispute. 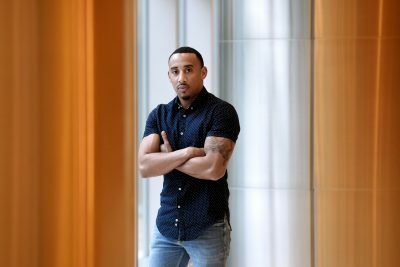 When Officer Hugo Thurmond’s grievance came before arbitrator Zimmerman, the facts were set: Thurmond had shot a man while off-duty and then fled without securing the scene or witnesses or even reporting it. So Zimmerman was deciding whether Thurmond’s failure to follow protocol warranted his 10-day suspension. Thurmond and a woman he told investigators he had offered a ride to were parked in the Garfield Park neighborhood at 5:30 a.m. in June 2009, when a man tried to force the pair out of the car. Thurmond shot the man and drove off, leaving the man wounded and letting the woman out a few blocks away without getting her name or a statement. The man crawled through a vacant lot and an alley, looking for help. A homeowner saw him and called 911. Thurmond waited a half-hour to report the shooting. Zimmerman agreed with the union. In her decision, she cited the chaotic nature of the situation in concluding that Thurmond did not deserve a suspension. Zimmerman, a former chair of the Illinois Labor Relations Board who is married to arbitrator Nielsen, declined to comment. Thurmond could not be reached for comment. The written decisions also offer a window into why arbitrators would rule in favor of an officer even when there’s clear evidence of wrongdoing. They may find that the misconduct warranted punishment but the discipline process was unfair. That’s how Officer Jeffrey Kriv got a lesser punishment than he otherwise would have. Have You Ever Filed a Complaint Against a Chicago Police Officer? Tell Us What Happened. There may be information about your case you’re unaware of. Kriv was charged with misconduct for a 2008 incident caught on video in which he reached into the rear of his squad car and punched a man detained on suspicion of drunken driving. The man had spit on him. Kriv said he punched the man in self-defense after the man tried to kick him. But an IPRA investigator concluded that the video did not show that. Kriv, the investigator said, could have instead shut the door and asked for help. IPRA recommended a five-day suspension in 2014, nearly six years after the incident, and Kriv filed a grievance. The police superintendent agreed with IPRA that Kriv should be suspended, telling the arbitrator that Kriv “could simply have closed the door.” The union argued that Kriv used “reasonable force” to defend himself. It also pointed out that the man, who pleaded guilty to drunken driving, declined to cooperate with the IPRA investigation. Zimmerman agreed that Kriv was guilty of mistreating the detainee. But she decided five days was “excessive,” citing how much time had passed between the incident and when the officer was served with the penalty. She gave him two days without pay. It wasn’t Kriv’s only discipline, or his only successful grievance. In 2004, in a settlement agreement, he had a different five-day suspension reduced to a reprimand, records show. “I was pissed I got suspended at all, to be honest with you,” Kriv said in an interview. “He starts spitting on me. It is disgusting. … What are my options? I am not going to duck and weave. I went in the back and clocked him. You are damn right I did. It got him to stop.